LARKANA: MNA Muhammad Ayaz Soomro has said that PPP will not let to derail democratic system in country, worst democracy is better than dictatorship, Punjab province being big brother should respect to its younger other provinces in term of water share or NFC Award, he expressed these notions while inaugurating the Bachat Bazar here at Jinah Bagh Larkana on Sunday. MNA Muhammad Ayaz Soomro further said that PPP has always strived hard to strengthen democratic institutions and played its role to address the public issues, added that PPP government has provided the jabs to unemployed youth on the other hand PML N government snatches the two square meal by them jobless, he alleged. He said that PML N government is reluctant to provide the development budget to opponent MNAs among PPP by following discriminative policy, present rulers in Sindh have spread the net of development works in Sindh by following the foot prints of Shaheed Benazir Bhutto. Earlier MNA Muhammad Ayaz Soomro along with DC Larkana and local PPP leaders inaugurated the Bachat Bazar at Jinah Bagh Larkana and visited the different stalls. Talking to media men he said that objective behind the establishment of Bachat Bazar in Larkana is to provide the relief to poor people, subsidy on wheat flour is being provided while requests for giving subsidy to other food items have been made to CM Sindh. On the occasion Deputy Commissioner Larkana Ghulam Qadir Junejo, Assistant Commissioner Larkana Masood Bhutto, PPP Leader Khair Muhammad Shaikh and others were present. 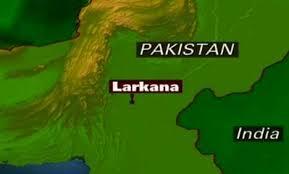 LARKANA: Assistant Commissioner Dokri Ameer Ali Mirani on Sunday visited the different Benazir Income Support centers, directed the concerned officials to ensure the required facilities to poor women and distribute the stipend among women by transparent manner. Assistant Commissioner Dokri paid surprise visits of HBL BISP Center Dokri and Garello where he inquired the problems of women and he assured them that stipend will be distributed among all women before the Eid. On the occasion In charge BISP Center Dokri Azhar Kango and Garello In charge Ghulam Mustafa Janvri briefed to Assistant Commissioner and said that all out efforts have been made to distribute the stipend among the poor women without any problems, informed that concerned staff is striving hard to maintain the row in center . He appealed to women and masses to play their role to maintain the row during at BISP Centers and avoid mismanagement and agent mafia.